Short-version: Now that we won a ton of elections(! ), we’re launching two new, big guides outlining the Indivisible strategy for the next two years. Indivisible on Offense demystifies what the new Democratic House Majority means, and how you can use it to make your voice heard. Our new state guide describes how to take the Indivisible philosophy and push for state-level policy change with your state representatives. Read our note below for how we got here. Donald Trump is the biggest popular vote loser in history to ever call himself President-Elect. In spite of the fact that he has no mandate, he will attempt to use his congressional majority to reshape America in his own racist, authoritarian, and corrupt image. If progressives are going to stop this, we must stand indivisibly opposed to Trump and the members of Congress who would do his bidding. Together, we have the power to resist — and we have the power to win. Looking back, we think this holds up pretty well. And the growth of the Indivisible movement, and what you have accomplished, has surpassed our wildest expectations. You didn’t just read the Guide. You didn’t just start groups in your hometowns across the country. You made Congress listen. In 2017, Indivisibles went to town halls, die-ins, and district offices. We defeated TrumpCare, rallied for immigrants, and turned the Republican tax cut for the rich and corporations into an enormous political liability. We stiffened Democratic spines and weakened Republican resolve. We couldn’t stop everything — but we did stop a lot. The grassroots were responsible for Democrats retaking power. Taking back the House used to be a pipe dream. It’s easy to forget, but just a little over a year ago, winning back the House was an idea that was too crazy for conventional Washington wisdom (read: pundits). Folks had good reason to believe taking back the House would be impossible. Back in 2010, the Republican Party succeeded in their sinister plot to flip targeted state legislatures and the House, giving their party control over redistricting after the 2010 census. And with that power, they drew gerrymandered districts to ensure a GOP House majority, no matter how unpopular their party became. But where Republicans built a seawall, you built a bigger blue wave. A week ago, we flipped the House. We flipped 6 state legislatures. And we moved the whole country to the left. 317 out of 435 Congressional districts (73%) were more blue on Tuesday than they were in 2016. Indivisibles endorsed candidates, knocked doors, registered voters, phonebanked and textbanked. You dragged your friends, family, and neighbors to the polls. Drop by drop, you built the blue wave and remade Congress, state houses, and governors’ mansions. And as a result, our slate of elected leaders at every level across the country will feature people who look like America, ready to fight for economic and racial justice and beat back the worst of Trump’s attacks on our neighbors, communities, and future. After two years of defense, we now go on offense. We go on offense in the House. With the majority, House Democrats can determine which bills get votes and there are two big opportunities to go on legislative offense in 2019 and 2020: messaging bills and must-pass bills. House Democrats can also hold Trump’s entire administration accountable through oversight and investigations (subpoena power, investigatory power, congressional-hearings power, and more!). This all gets complicated, but check out the guide for practical steps on how to use this intel. We start making gains in the states to save democracy. There are huge opportunities to resist Trump and provide a progressive vision for the country through state-level advocacy. And many of the same principles you use when advocating for federal change apply at the state level. With the big gains last Tuesday, we have a lot more opportunities to accomplish proactive policy wins — and this all starts happening early in 2019 when state legislatures are sworn in. This is the road to stopping Trump in his tracks, locking in the gains we’ve made, and advancing an alternative vision for the country rooted in democracy, inclusion, and respect. This is the road to retaking the White House in two years. But none of this is automatic. We won last Tuesday. Now we have to make those wins mean something going forward. 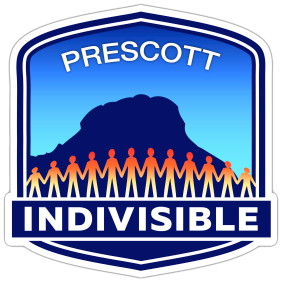 Find your local Indivisible group. No, really. The key to the Indivisible movement is building strong, local groups. And if you haven’t found yours yet, you need to right now. Want to start your own? Awesome. Do it. Read our new federal Guide: Indivisible on Offense. New power in the House means we need a new game plan to demand that our newly-elected members of Congress check Trump and offer an alternative to his backwards agenda. Read our new state Guide: Empowering the States to Resist the Trump Agenda. Some of the most important work you can do to save our democracy is to take action in your state legislatures around the country. Two years ago, we wrote the Indivisible Guide because we knew that everything we hold dear was under threat. We’ve lost a lot since then, but we ‑‑ along with critical partners — have accomplished so much. We resisted. We retook power. And with control of the House of Representatives and new power in the states, we will band together, indivisible to remake this country.